It is with much sadness I have to report that Elizabeth Dyas has cancelled her talk on hedgehogs due to ill health. We have managed to get replacement speakers for Tuesday 11th October. Local couple Prissie & Denis Holwell will give an illustrated talk on The Dutch gardens Keukenhof. Tiverton & Heathcoat Photographic Club are running a coach trip and Chairman, Bette Delling, says that there are still seats available to National Trust property Tyntesfield House & Gardens which Garden Club members can go on. On Sunday 9th October, leaving Kingdoms Coach garage at 8am, with various pickups along the way. Please contact Ros Nichols, who will pass on details to Bette, as soon as possible if you would like to join us. A fine Victorian country house created by one of England’s richest commoners, William Gibbs, who built his fortune on fertiliser. Spiralling turrets and pinnacles adorn the roof, ornate stone carvings and church-like windows complete the Gothic look, giving the feel of a mysterious, fairytale mansion. Terraced lawns give way to spacious parkland scattered with hundreds of trees collected by the family, and a glorious walled kitchen garden beyond. Four generations of the Gibbs family called Tyntesfield home, filling it with both the splendid and the ordinary – from fine porcelain and fabulous textiles, to picnic sets and ice skates. Unusually for a stately home this one displays its wears and tears and that’s what makes Tyntesfield truly unique. Come and see the progress that has been made on this groundbreaking restoration project. The house now has a new roof, is free of scaffolding and our new Home Farm Visitor Centre is open – try out our new shop, Cow Barn restaurant, interactive wildlife hub and garden shop. On Friday 21st October 2011 the Mid Devon Natural History Society are having a talk entitled "The Worms in your Garden". is made for first time visitors. cordially invite any of your members who would care to come along. Despite difficult weather conditions during the summer there were some beautiful blooms on show at The New Hall for the Club's Autumn Flower Show. Entries were down in the decorative section but there was still an high standard of exhibits to see. Principal winners were Tim Nichols; Ros Nichols; Emma Nichols; Jean Webb and Pat Cyprus. The Award of Merit went to Jean Webb for her Pretty in Pink arrangement, which also won the new special class trophy The Bethany Hope Memorial Cup. In the Childrens' section the winners were Paige Nichols & Jessica Ridgeway. In the Cut Flowers section the principal winners were: Alby Berry, Chad Stone, Mary Sedgbeer, Peter Billing, Margaret Grose, Pat Cyprus, Ann Crawford with Peter Billing winning the Award of Merit for a vase of Annual flowers. In the Shrubs and Trees section the principal winners were: Peter Billing, Rachael Hart, Ann Crawford, Jean Webb and Jean Bennett with Peter Billing winning the Award of Merit of a vase of flowering shrubs. In the Pot Plants section the principal winners were: Mary Coles, Peter Billing, Margaret Grose, Chad Stone, John Mears, Jean Bennett, Ann Crawford with Jean Bennett winning the Award of Merit. 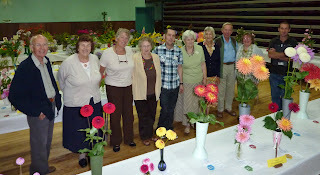 In the Members Plant Growing Competition we had a record number of entries which made it hard work for the judge. The winner was Pat Cyprus; second Jean Webb & third Rachael Hart. The Award of Merit went to Angela Parrott for her Garden Tools. The Jubilee collection class proved a tightly contested competition with the winning points going to Ann Crawford with Pat Cyprus a close second. Many thanks to the judges: Ginny Addison-Smith; Paul Fonnerau from Cove Garden Nursery and Peter Sluman.